Gravitational waves may be forged in the heart of the galaxy, says a new study led by PhD student Joseph Fernandez at Liverpool John Moores University. He sets out the work in a presentation on 3rd April at the European Week of Astronomy and Space Science in Liverpool. Gravitational waves (GWs) are small ripples in space-time that spread throughout the universe. When there is a change in air pressure on Earth, this change moves outwards in the form of sound waves. Analogously, when pairs of compact objects – like black holes (BHs) or neutron stars (NSs) – form binaries and rotate around one another, the gravitational field around them changes, producing GWs that also move outwards. These originated from a pair of stellar mass black holes (around 30 times the mass of the Sun each), which fell together, and eventually merged. Since then, another four confirmed observations of GWs have been reported to originate from these systems, and with the LIGO and VIRGO improvements currently underway, we expect to see many more in the near future. These observations show that BH mergers are commonplace in the Universe. However, we are still not sure how these sort of binary systems form. This is because they need to be on very close or very eccentric orbits in order to collapse in such a way that GWs are observable. Fernandez and colleagues, including another PhD student Brown, have shown that the orbits of binaries can be changed by the black hole that lies in the centre of most galaxies, including our own. A massive black hole results in very intense gravitational fields and extreme physics. If a compact binary were to have a close encounter with one, then in most cases it would be disrupted and its component BHs or stars would be separated. However, this isn't always the case. Binaries can emerge from the tidal encounter undisrupted under certain conditions, with their orbits suffering severe modifications. By using Monte Carlo simulations, Fernandez has shown that surviving BH binary systems can become tight and eccentric, reducing the merging time by over a factor of 100 in 10% of cases. This could be sufficient to force binaries that wouldn't merge within the lifetime of the Universe to do so sooner, leading to observable gravitational waves. This process can also flip the binary system orbital plane, making the BHs orbit in the opposite direction to their initial conditions. This can lead to negative effective spin values, which could be used to distinguish this mechanism from others. 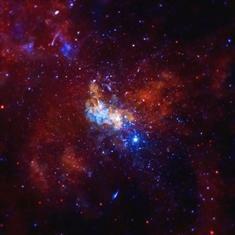 Sagittarius A*, the black hole at the centre of our own galaxy. Credit: NASA/CXC/MIT/F. Baganoff et al. The European Week of Astronomy and Space Science (EWASS 2018) will take place at the Arena and Conference Centre (ACC) in Liverpool from 3 – 6 April 2018. Bringing together around 1500 astronomers and space scientists, the conference is the largest professional astronomy and space science event in the UK for a decade and will see leading researchers from around the world presenting their latest work. Liverpool John Moores University (LJMU) is one of the largest, most dynamic and forward-thinking universities in the UK, with a vibrant community of 25,000 students from over 100 countries world-wide, 2,500 staff and 250 degree courses. LJMU celebrated its 25th anniversary of becoming a university in 2017 and has launched a new five-year vision built around four key 'pillars' to deliver excellence in education; impactful research and scholarship; enhanced civic and global engagement; and an outstanding student experience.